Delaney James is an everyday girl that works as a waitress. One day she heads back into work after her shift and sees her boss killing someone in the restaurant. He figures out that she saw everything and is out to get her. Delaney is running from the scene of the crime when she stumbles into the perfect opportunity to get out of town. You see, she winds up a dating service office and claims the identity of one of the women selected to meet a match. That's all it takes to get Delaney into the cute Halloween town called Nocturne Falls. I'm in love with the idea of Nocturne Falls, it's Halloween there every day of the year. The paranormal beings that live there are for real and can basically live in plain sight since it's dismissed as them playing the part for Halloween. Anyway, Delaney goes and meets "her" match, Hugh Ellingham. He's a hunky vampire that didn't want to be set up by his grandmother. When sparks fly between Delaney and Hugh, they both agree to get to know one another for the 30 days that his grandmother requires. I was just waiting for the big scenes to happen and curious how they would play out. Delaney admitting she isn't the person she's pretending to be, and Hugh telling her that he's a vampire. 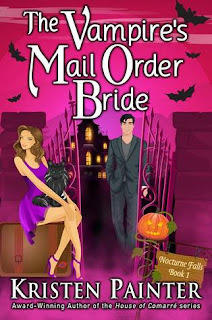 I've been on a paranormal romance kick lately and had to grab this book when I saw it was a freebie for a limited time. While I wish some things in the plot were delayed a bit before they came to play, I still enjoyed the book. I'm seriously loving the concept of this series, and already know I will be buying the other books. I'm doing a happy dance over here, books two through four are already out so I might need to do a marathon read sometime soon. If you're looking for a paranormal romance and love all things Halloween, I highly suggest this series. I've enjoyed Kristen Painters work in the past. I did pick this up as a freebie too. I'll have to try it out once I get through some of my review books. Gah! I missed this freebie! Is it lendable? Maybe I can borrow it from you one of these days? It is! Give me a shout when you want it. It has been too long between vampire books for me. This one sound great! That's how it was with me. I took a VERY long break from vampires and paranormal romance. For some reason I'm in that mood lately though! Halloween everyday of the year? ikd, lols. But this sounds like a fun read Mel, looking foward to the rest of your reviews. It's a tourist town too, I bet it would get old living there, but it was fun to read!